The key to exploration success at the Woodlark Island Gold Project has been in understanding the relationship between structural dilation centres, coincident with aeromagnetic lows and alteration centres to define targets, followed by the use of low cost reserve circulation (RC) drilling. 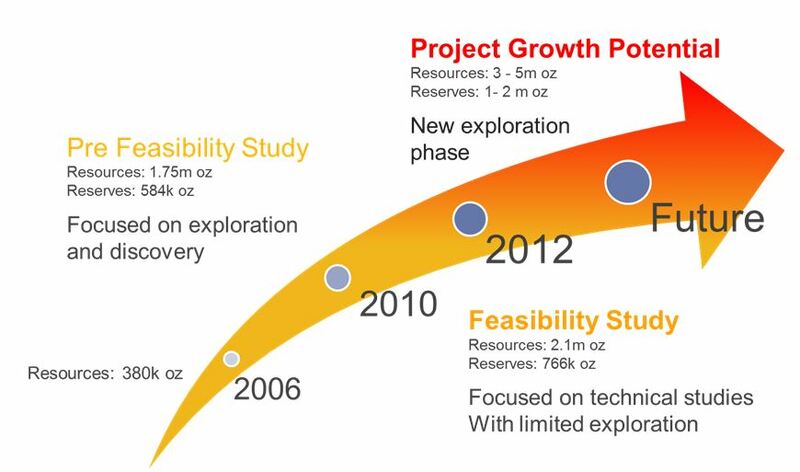 This approach has consistently increased the Resource base of the Woodlark Island Gold Project. During the period from 2006 until 2010 a drilling program increased the historical Resource of 380,000 ounces to 1,750,000 ounces at an approximate discovery cost of US$30 per Resource ounce. During the period from 2010 until 2012 and at the completion of the Feasibility Study the Mineral Resources grew to a total of 2,120,000 ounces whilst the confidence in the Resources increased with further infill drilling and technical studies required for the Feasibility Study. 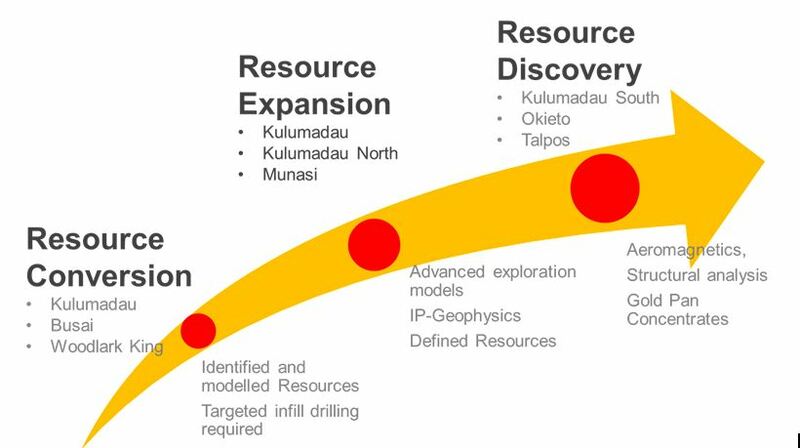 The exploration drilling to date has targeted mineralisation adjacent to the known historical mining centres of Kulumadau, Busai and Woodlark King and considerable potential has been identified to grow the Resource toward 5 million ounces. The Woodlark Island Gold Project contains a pipeline of Resource and Reserve Growth opportunities. These range from the conversion of known Inferred Resources from within and surrounding the known Reserves, to increasing Reserves through new discoveries from regional targets derived from Aeromagnetic and structural analysis. These targets are contained within the geological models of known deposits. Increased drilling density is required to improve the confidence of these Resource to the Indicated and Measured Resource categories, to allow their use in the determining of Reserves. These targets are developed from advanced exploration models, additional geophysical surveys and limited resource definition drilling results. These targets have been developed using a combination of exploration vectors, including structural analysis, aeromagnetic surveys and gold panning concentrate analysis. These targets require further field work to sure up their potential.